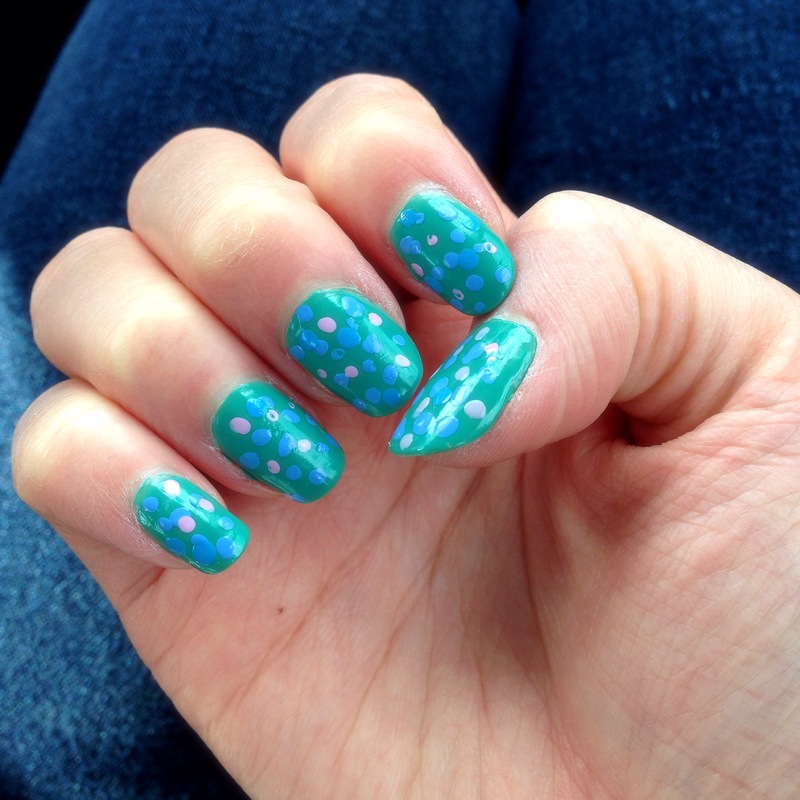 Anyway, since both Easter and St. Patrick’s day coming up, I decided to do a pastel mani with a green base. The green color here is Orly Green with Envy. I thought it would be a creamy pastel, but it is actually a weird sheer green. It took four coats to get this opacity. I do not recommend this color not only because of its sheerness but also because of its short wear time. I dotted two other Orly colors onto my nails, Lollipop & Snowcone (lavendar and sky blue, respectively). They have an even worse wear time than Green with Envy, so I don’t recommend them either. I have tried them with both the Orly bonder base and an OPI base. There was no difference in wear time when I used the same brand’s basecoat with these polishes. It could just be the pastels though. These are the only Orly polishes I have ever tried. I also used two Colorstay polishes from Revlon. These polishes have a decent wear time for drugstore nail lacquer, but the brushes on all of the Colorstay polishes are cut unevenly (including ones I did not picture in this post). This makes creating a nice manicure nearly impossible. The colors I used are Provence & Coastal Surf (gray-lavendar and french blue). Have you ever tried these brands? Did you get the same results I did? Well, I have some news for people who refuse to love math and celebrate Pi Day. Today is also White Day! No, white day is not a day where we celebrate white people. It is a holiday made up by confectioners in Asia to sell more candy. No, seriously, it is. I don’t know which countries celebrate it other than Korea and Japan. However, both countries make the girls give the boys they like candy on Valentine’s Day. A month later on White Day, the boys respond in turn. We don’t usually celebrate White Day at our house, but we decided to try it this year. My husband surprised me by taking the day off to do fun things with me all day! So far I have gotten two bouquets of flowers, seen a movie, gone shopping, and eaten pie. Pretty good day, right? What have you been up to today? Let me know in the comments!